22/03/2019 - April newsletter now available. 18/02/2019 - March newsletter now available. 28/01/2019 - February newsletter now available. 04/01/2019 - January newsletter now available. 19/11/2018 - December newsletter now available. 26/10/2018 - November newsletter now available. 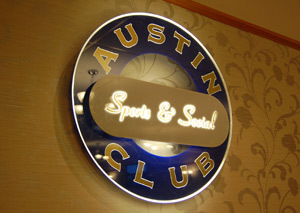 Welcome to The Austin Sports & Social Club! Serving as a focal point for local residents, we are providing facilities that we believe are second to none. These include a comfortable lounge which has free entertainment twice a week, a very modern bar which is geared towards families, and a concert room which provides top class entertainment several times each week. The concert room has recently been refurbished to a very high standard, making it one of the Midlands' premier entertainment venues. There are also indoor and outdoor sports facilities and a patio with a children’s play area. A full catering service is provided. Here on our website, you'll find all the information you need about the club, and what we can offer to you!